Membership in the Orchid Society of Southern California is open to all. Membership dues are $35.00 per year per household, payable in January of each year. New members may join at any of the monthly OSSC meetings, or can download and print the membership application from here and send it to the address on the form. (You will need the free Adobe Acrobat reader to view and print this document). 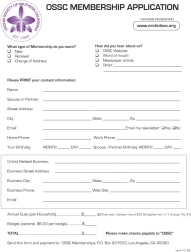 Membership renewals and changes of address can also use this form. Persons joining OSSC in November or December will have their membership in force for the full following year. Persons joining between July 1 and October 31 pay the half-year rate of $17.50. Payment of dues may be made by cash, personal check or credit card. Members may optionally purchase a personally engraved OSSC name tag for $8.00 apiece. Members wearing their name tag are eligible for a special drawing during the evening's raffle. The OSSC newsletter, mailed or emailed to you monthly. The newsletter contains information about OSSC activities, informative articles, an orchid event calendar, results of the orchid judging at the previous meeting, orchid culture tips, photos from OSSC events, and much more. Monthly talks from worldwide orchid experts. Use of OSSC's outstanding Reference Library. Opportunity to win beautiful, quality orchids in our monthly Orchid Raffle. Participation in the special "members wearing their badges" raffle drawing that precedes the regular raffle drawing. Discounts from various vendors toward purchases of orchids and orchid supplies. The opportunity to network with other local orchid enthusiasts on a regular basis, including amateurs, advanced collectors, and commercial growers. Participation in OSSC's annual Holiday Party. An opportunity to participate in the creation of OSSC's display at the annual Huntington Botanical Gardens International Orchid Show. The ability to join us in field trips to out-of-town orchid vendors and events. IN ADDITION, new members will receive $5 worth of raffle tickets for that meeting's raffle. NEW! Beginning July 2011, new members and their sponsors will receive a certificate good for a free 1-gallon Cymbidium orchid, courtesy of Orchids by Art.